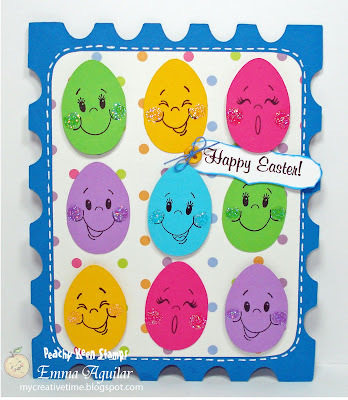 My Creative Time: Happy Easter Postcard! Super Cute! Love those little faces! Just adorable! I like the polka dot paper too! Happy Easter! How cute. I would have never thought of using those stamps like that. I have that sent of stamps. Thank you so much for taking the time to share. Happy Easter and your card is so sweet. Very, very cute!! Happy easter. Emma what a cute idea a postcard. So cute Emma. Hope you have a wonderful day. Emma, this is wonderful ... it made me smile!! I love the idea of a postcard. Very cute. Such a sweet lil' postcard! Love it! This is absolutely adorable Emma! Your creativity is beyond awesome. I just love it. Happy Easter to you and your sweet family. Happy Easter to you and your family. Your card is just too adorable! Very Cute!!!!! Love the faces!! Thats a very cheery Easter card!! I LOVE IT!! Very CUTE!! Love this card. Happy Easter. What cute expressions on each egg! Hope you're having a Hoppy Easter! CUTE! Lovin' their little glittery cheeks. Happy Easter! Emma this is adorable! What a great way to use all the stamps. I hope you had a wonderful Easter. I am having a celebration at my blog and would love to have you visit. Tehehehehe....Emma this card is just too cute!!! Very cute Emma! How do you keep your faux stitching lines so straight? Do you use a template or a ruler... You do a fantastic job. Thanks for sharing. WOW.. Emma.. !! This is the cutest thing ever!! I love what you did with both your gypsy and our faces!! Just adorable!! Great job!! :)Big Hugs! I love the idea behind this card. And you can change the eggs out for each holiday! Simple and Cute! Thanx!